What happens when you self-publish a piece of text which grabs eye-balls of millions and then you have the onus of delivering a book? You are careful with the language you use. The Secret of the Nagas, the second book in the Shiva Trilogy, is Amish’s second attempt at writing, among many other things. In the first book, it was established Amish is a banker who is a good story-teller. In this book, there is glaring evidence that the man has tried to improve his writing for which I must applaud him. That is something Chetan Bhagat never tried to work on. But enough about bad story tellers who claim to be writers. pick it up if you haven’t read TIOM; there is no fun in that though Amish claims in the foreword that this book can stand on its own. For what it’s worth, it cannot. The second book does not take off where the first left us, which is quite a relief actually. In this part of the trilogy, Shiva is on his quest to vanquish the Nagas to avenge the death of his ‘brother’ Brahaspati and also because he has been told incessantly how the Nagas are the root of evil and they must be destroyed. The book takes off slowly, trying to meander through stories of Princess Anandmayi luring the celibate General Parvateshwar and of the Branga tribe. Honestly, there comes a point where Amish has lost you. So, you rely on your curiosity to find out what is the deal with the Nagas and carry on reading. And when you get on to the ride (it is a ride, I can’t help but admit) you are told of the plague that looms over a kingdom, you are taken to different parts of India as Shiva searches for the Nagas, and you are now in Kashi where the base of the story is. While Shiva is looking for the Nagas, his family and entourage has now become bigger. Blessed with a son, Kartik, Shiva is a more measured man with a sole purpose. As he is looking for evil, events starts to unfold slowly. Like a multi-layered suspense Bollywood movie (It’s still a Bollywood movie) you learn of why peacocks are being killed relentlessly, how the medicine to save Shiva’s son came from the Nagas and why Parshuram—a Brahmin turned bandit—beheaded his own mother. There is also much reference of the engineering marvels of the Brangas and some complex explanation which was very difficult to follow. The Vasudevs make their appearances throughout the book and their characters are shown in grey light this time. The Kings Dilipa and Daksha are shown in poor light too, their characters questioned and tables turned. Everything that was white in Book 1 turned black in Book 2 and vice versa. All in all, there is a lot of meat in the book, but the problem lies in the title. The title suggests that one will be made aware of the secret that the Nagas possess, however, there is nothing to that effect. You’re speeding though to the last few pages to know what it is and you find nothing. That, was a major let-down. 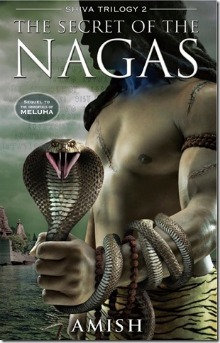 You enter Naga territory and the book is over. There is some nuanced wisdom in this book. Wisdom that Amish could have captured in beautiful ways, but he couldn’t. This is where the flaw lies. Given that this book is based on age-old stories that have come to us because of their indestructible nature, one would hope to have bursts of take-aways. Alas, his writing fails him here. Nonetheless, I loved the portion where Shiva’s uncle explains to him how he is not responsible for other people’s karma, only his karma. There are umpteen events where the book says that evil is just another side of a coin. In fact, the way Shiva uncovers the truth of why people do what they do explains why we should never judge a person. And there is almost nothing such as good or evil. I was hoping all this could have emerged in better light. However, this book is a good sequel to The Immortals of Meluha and a better prequel to The Oath of the Vayuputras. I am interested to see how he has finished off this series. It would also be interesting to note how he has grown as a writer or even better, to see what the publishing company’s editors did to his text. The Secret of the Nagas is devoid of a secret, but is a book worthy of your time. There will be a review for The Oath of the Vayuputras too. Watch this space. this is such a splendid book!!!! Yes Bhadra, it’s a good follow up. Somehow, and this is just me personally, I thought his first book had better thought and more flow than the second one. This book had so many plot “holes” plugging into the next book that it made reading it a little taxing.. maybe it was because he didn’t necessarily know if his second book would ever see the light of day so he made the first book a brilliant “standalone” book. And it wasn’t like any other series where just certain plot elements are linked to other books – it was a disconcerted effort to make me spend a few hours on the last book (which I did). Extremely good book . language used was impressive . happy to read it and excited to read the next part . It was more than once that the story was lost on me. It was a lot to keep up with I felt. Good review though. This is better than the 3rd one, so you can imagine. Too many war scenes. I felt it was overdone just to make the book appear with a lot of meat.